There are three data files in NetCDF (.nc4) format with this dataset. Figure 1. Leaf area index at 30 km resolution for the month of January. This figure was created from the data file leaf_stem_area_index_monthly_climatology_2003-2010.nc4. The datasets are generated with support from NASA Terrestrial Ecology (TE NNH12AU03I) and New Investigator Program (NIP) (NNH13ZDA001N). Temporal resolution: Climatology is average values for each month (12 time steps) representing data between 2003-01-01 to 2010-12-31. The “*_8day” data retain the original 8-day MODIS composite resolution. There are three files in netCDF (.nc4) format with this data set: one file with albedo parameters (data every 8 days), one file with stem and leaf area index (data every 8 days), and one file with monthly leaf area and stem area index, dominant land cover, and vegetation area fraction data. The data are provided at 30-km resolution that is generally useful for most RCMs. infrared_visible_bands_8day_2003-2010.nc4 Provides 8-day albedo parameters -- the LiSparseR, Isotropic, and Rossthick parameters for near-infrared band (0.3-5um) and for visible band (0.3-0.7um). Temporal extent: Every 8 days from 2003-01-01 to 2010-12-31.
leaf_stem_area_index_8day_2003-2010.nc4 Provides 8-day leaf area index and stem area index. Temporal extent: Every 8 days from 2003-01-01 to 2010-12-31. Table 2. Variables in the file infrared_visible_bands_8day_2003-2010.nc4. *These albedo parameters are discussed in Schaaf et al. 2002. Table 3. Variables in the file leaf_stem_area_index_8day_2003-2010.nc4. XLCC none Dominant land cover category: USGS 24-category Land Use Categories. See Table 5 below. Table 5. USGS 24-category Land Use Categories. These data were developed to replace the AVHRR-derived vegetation parameters for use as surface input data for regional climate models (Xu et al., 2014). Use these data with caution: No quality assessment is provided. The uncertainties are expected to partially inherit from the original MODIS data products. Please note that the MODIS Version 5 land data products used in this dataset have been superseded by Version 6 data products. Known Issues: The albedo parameter (V005 MCD43B1) product used here only represents the average of the underlying MCD43A product (with the majority QA) and thus is considered a poorer quality product. MCD43B was discontinued in V006. In V006, MCD43A* represents the primary retrieval for this product and is recommended for all users. The MCD43D* products are provided on a 30arc second Climate Modeling Grid (CMG) and are recommended for use in climate simulation models. As with all MODIS products, we recommend you use these data only with a complete understanding of the associated QA flags. This dataset provides vegetation parameters (LAI, SAI, FVC, and LCC) and albedo parameters derived from MODIS Collection 5 data products for use in regional agroecosystem-climate models.. The MODIS Collection 5 data used to derive the vegetation parameters were the Terra yearly water mask and vegetation continuous field products, and the combined Terra and Aqua yearly LCC (MCD12Q1), 8-day composites for LAI (MCD15A2), and albedo parameter (MCD43B1) products. The products were first aggregated from their original spatial resolutions to a 1-km sinusoidal projection and then remapped using a nearest-neighbor interpolation to a 1-km map projection within a computation domain defined by users. Pixels were processed only where the embedded quality control (QC) flag indicates best quality. The remaining pixels were assigned a missing value. To remove the missing value pixels and minimize cloud and snow contamination, multiyear data were used to construct a monthly climatology of yearly data and the 8-day composites. The processing of the MODIS products are described in detail in Xu et al. (2014). Date Range: The detailed processing described in Xu et al. (2014) refer to MODIS data products over the date range of 2000-2010. The data provided in this dataset are a subset from 2003-2010. The data prior to 2003 are generally of poor quality and have many missing values and were excluded. Spatial Resolution: The detailed processing in Xu et al. (2014) describe various conversions and reprojections of the data for comparisons with other products and to accommodate specific regional agroecosystem-climate models. The data provided in this dataset are an aggregation of the 1-km products to a 30-km resolution that is generally useful for most regional agroecosystem-climate models.. The data user is referred to Xu et al. 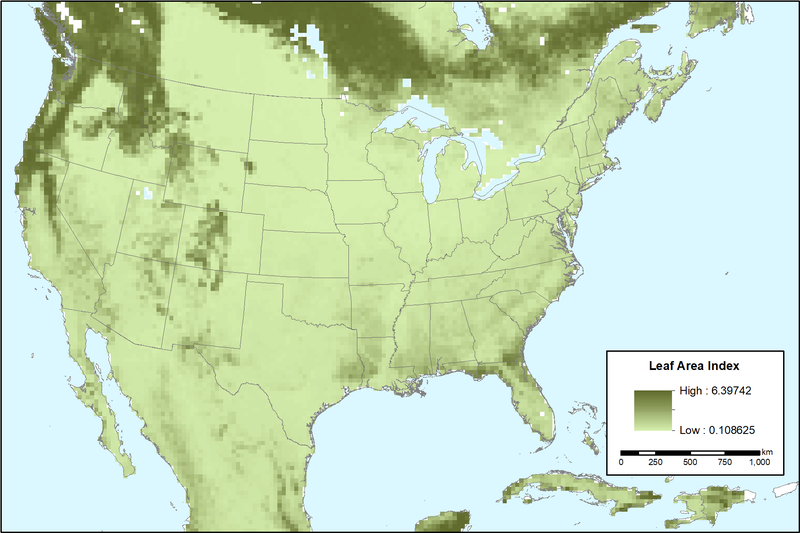 (2014) for complete processing details for the land-cover category (LCC), fractional vegetation cover (FVC), leaf and steam area indices (LAI and SAI), and land surface albedo parameters. This dataset documentation was revised on 2018-04-10 to indicate known data quality issues with the MODIS Version 5 MCD43B data product.